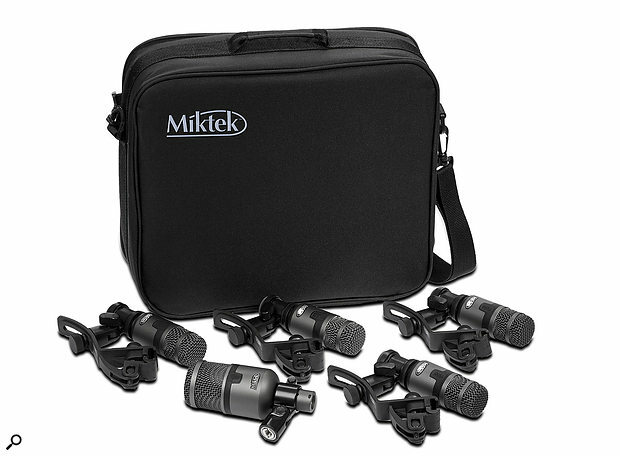 Miktek’s TDK5 five-piece mic set comprises a set of five moving-coil microphones designed for close-miking of drums, but leaves the user to provide their own overhead mics. The kit includes one T200 kick-drum mic and four T100 snare/tom mics, as well as four drum-rim mic clips, all packed into a rigid-foam-lined, woven fabric carry case that’s deep enough to allow you to leave the mics attached to their rim clips. Both the T200 and T100 are also available separately and, being moving-coil mics, they can handle very high SPLs without problems. 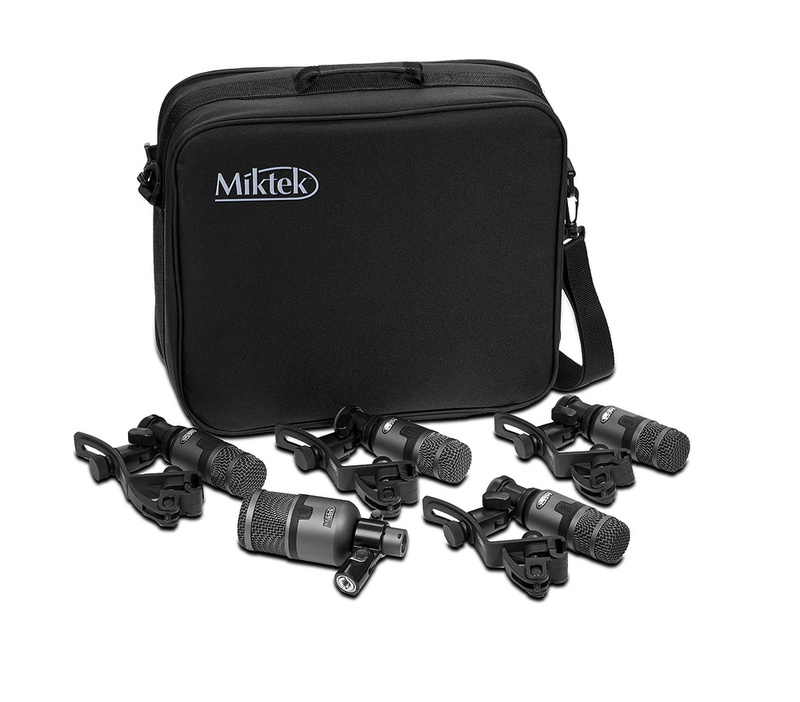 Both mics have cast bodies and robust steel mesh grilles with a stylish, dark-grey metallic finish. The T200 has the stubby, chunky profile we’ve come to expect for kick-drum mics. Though voiced for kick-drum, the T200’s response curve doesn’t look quite as scooped as some of the competition, with maybe 4dB of lift at around 70Hz and some 8dB of boost centred on the 6kHz region. Suggested alternative uses include low toms and acoustic basses. Its supercardioid neodymium-magnet capsule feeds out via a custom balancing transformer, and the spec sheet tells us that an inductor is used in the audio path. Apparently the circuitry is designed to ensure a phase-coherent LF boost to deliver a tight, even bass sound. The quoted frequency response is 50Hz to 10kHz; the frequency plot shows the response to be some 15dB down by the time it reaches 20kHz, which is perfectly acceptable given what we expect a kick-drum mic to do! A rigid swivel clip clamps around the neck of the mic holding it very firmly, and a screw can be used to increase the friction of the swivel joint if necessary. A US/EU thread adaptor is included. Being a supercardioid design, the mic has a significant proximity effect that can be used to further bolster up the low end by placing the mic closer to the source. This tight polar pattern should also help cut down on spill and feedback (but bear in mind that the least sensitive angle for such mics is 135 degrees off-axis, rather than directly behind, as is the case with cardioids). Stylistically similar to the T200, the T100 is only slightly shorter and about two thirds the diameter. It is recommended for toms and snare drums but can also double as a guitar cab mic. The capsule is again supercardioid, based on a neodymium magnet and routed via a balancing transformer. It covers the 50Hz to 16kHz frequency range, which is typical for a moving-coil microphone of this type. The response curve is nominally flat from 100Hz to 2kHz, rising to a broad presence hump in the 5kHz region to add a little definition to stick hits. At the low end there’s a dip of a few dB at 50Hz. The mic comes with an elegantly designed drum rim clip, which is adjustable for rim depth and also features a quick-release lever. The swivel mic clip tracks along a slot in the curved upper section of the rim clip, providing a sensible degree of adjustment when positioning the mic over the drum head. Large metal thumbscrews are used to lock the mic and clip in place. Following the ‘designed in the US, manufactured in China’ paradigm that has become so familiar at the more affordable end of the microphone market, these T-series mics are sensibly priced and look to be very well made with a high standard of finish — so it all comes down to what they sound like under battle conditions. Snare and toms sound fine using the T100, the results with toms being particularly pleasing — lots of body and plenty of plummy resonance. On snare the results are also positive, though as is almost always the case, you need a little contribution from the overheads to bring back the high-end detail and to add a sense of air around the sound. An under-snare mic can also help, though I find that in most cases adding in the overheads does the trick. Little EQ was needed to get a very workable sound, so no complaints there. The rim clips also worked extremely well, keeping the mics locked firmly in place. Used on kick drum, the T200 picks up loads of low-end energy, but as its frequency response isn’t as scooped as some of the more obvious alternatives, I found that I needed to apply quite a bit of cut in the 200 to 250 Hz range to get rid of the boxiness that always plagues the petite 16-inch kick drum I use in the studio. The ‘click’ region also needed a little help from EQ. As always the position of the mic makes a big difference, but if you’re prepared to spend a little time finding the best placement and then fine-tuning the sound with EQ, the T200 is capable of very solid results. Overall, the TDK5 delivers on quality, given its lower-mid-range pricing. There are better drum mics if you are prepared to spend quite a lot more, but the TDK5 is a definite step up from a typical entry-level set, and those rim clips are the best I’ve tried to date. Buying a drum mic kit with no overhead mics makes sense if you already have suitable capacitor mics, and if not, adding something like a pair of Rode M5s or Prodipe Duo A1s will do the job nicely without breaking the bank. You could spend a bit more and buy something like four Shure SM57s and an AKG D112. There are also affordable drum mic kits available from other manufacturers such as Red5 Audio or Samson. 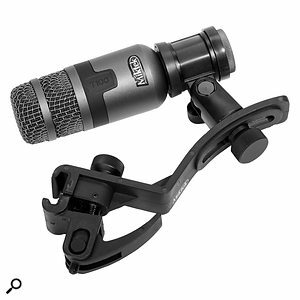 Sound quality good for mics in this price range. Kick mic may require a little more in the way of EQ than some dedicated kick mics. This is a practical drum mic kit for the price, as long as you can provide your own overhead mics to go with it.